According to southern Australian Aboriginal clans, the Dreamtime figure of Ngurunderi chased a giant cod with spear in hand through freshwater marshes, carving the Murray River around Kumarangk. The beautiful landscape where the river empties into the Southern Ocean has since been imbued with deep spiritual significance. 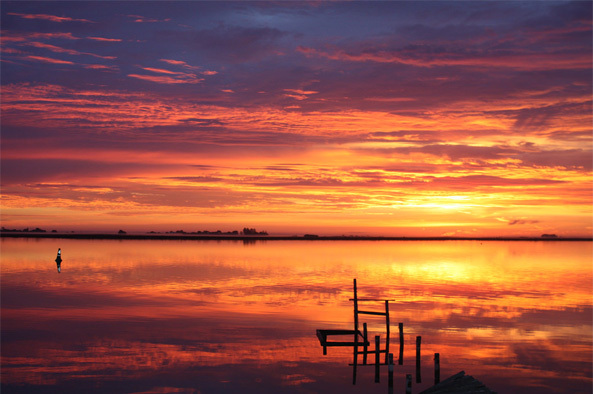 “Hindmarsh Island has a connection with the whole Ngarrindjeri nation and in particular what it means to Ngarrindjeri mi:minis (women) for their spiritual beliefs and for our other rituals,” Val Power, a Ngarrindjeri woman, told anthropologist Diane Bell. In recent years, this landscape has also been a political hotspot fraught with the racial and economic challenges of modern Australia. As the population of Australians of European descent has grown in South Australia, legal and social clashes with their Aboriginal neighbors have escalated. In 1999, a plan to construct a bridge from the town of Goolwa to the adjacent Hindmarsh Island stirred great controversy throughout Australia, breaking ancient silences and raising doubts as to the veracity of Aboriginal claims to sacred sites. The bridge plan was first proposed in 1990, as the Chapman family was preparing to begin a large marina-resort development on the island. It was alleged by conservationist groups that Tom, Wendy and Andrew Chapman, in their original agreement with the South Australian government, had agreed to shoulder half the costs of a bridge leading directly to their island resort but then reneged and pressured the government to pay for the entire cost. The conservationist groups allied with homeowners and ferry operators to oppose the bridge, insisting that the bridge would spur unwanted development and harm the environment. As debates over the bridge plan heated up in the press, a group of 25 Ngarrindjeri women came forward and claimed that the bridge’s foot would be planted directly at a sacred and secret women’s site. This claim, and a counter-claim by another Ngarrindjeri group, launched a nationwide debate over Aboriginal sacred sites and the role of the government in protecting and authenticating such sites. In 1994, the first group of women, led by Dr. Doreen Kartinyeri, applied for a ban on the bridge’s construction to Robert Tickner, who was the Minister of Aboriginal Affairs for Australia at the time. Respecting the women’s wishes that only a woman could know of “secret women’s business”, Tickner appointed a female anthropologist, Professor Cheryl Saunders, to investigate the claim. She reported that Ngarrindjeri women believed the bridge would make “the cosmos, and human beings within it, sterile and unable to reproduce.” Tickner promptly placed a 25-year ban on the bridge construction. The Chapmans appealed the ban in 1995 to the Federal Court. The Ngarrindjeri attempted to deliver an envelope labeled “Confidential: To be read by Women only” to Minister Tickner, which contained a written account of where the site was and why it was sacred. The envelope ended up at the wrong office, where an official in the opposition party photocopied the materials and passed them on to the Chapmans’ lawyers. When Parliament discovered his activities, the official resigned in disgrace. However, the Federal Court did eventually overturn the construction ban, reasoning that Minister Tickner should have reviewed the women’s case personally instead of appointing an anthropologist to verify the claim of a sacred site. The Chapmans then sought $50 million in compensation from the federal government for halting the bridge and preventing the development of their marina plans. However, the Hindmarsh controversy was not over yet. After the Federal Court’s decision, another small group of Ngarrindjeri women charged that the claim of a secret site was a hoax intended to inflate the cultural significance of the island for the sole purpose of preventing further development, especially the Chapmans’ marina resort development. These “dissident women,” led by Dulcie and Dorothy Wilson and Bertha Gollan, claimed that they did not know of any such “secret women’s business” on Hindmarsh Island. Two Ngarrindjeri elders, Doug and Sarah Milera, also denied knowing of “secret women’s business,” but months later they admitted to having been drunk at the time of their assertion and that they were possibly coerced into making those statements by the Chapmans. Unsatisfied with the Federal Government’s handling of the affair, the South Australia Government set up a Royal Commission to investigate the women’s religious beliefs in the area. Numerous issues arose during the investigation complicating the work of the Commission, including revoked testimonies, claims of intimidation and the consistent refusal of the first group of Ngarrindjeri women to testify about “secret” matters. Several environmental groups joined in the efforts to prevent the bridge, including the Conservation Council of South Australia (CCSA). The Chapman family was excoriated in the press by some and lauded by others for pursuing their plans or dream in the face of controversy and indebtedness. The legal and public relations battles did not stop there. In 1994, the Chapmans won an injunction against the Conservation Council of South Australia (CCSA) hoping to curtail its public opposition to the bridge plan. CCSA immediately countered the injunction, which was lifted. Their opposition activity escalated, and in 1998 the Chapmans charged CCSA with defamation, citing unfavorable CCSA-published descriptions of the bridge proposal and the family’s motivation. The Chapmans also sued the Kumarangk Coalition and Friends of Goolwa and Kumarangk, both organizations of local residents committed to supporting the Ngarrindjeri’s claims to Hindmarsh. At one point, the Chapmans had initiated twelve legal actions against bridge opponents, including anthropologist Cheryl Saunders, Minister Tickner and several others officials, lawyers and media outlets. A group of opponents formed the Kumarangk Legal Defence Fund in response to the Chapmans’ aggressive legal strategy. At the same time, two high-profile cases involving the Mabo and Wik people were ongoing, and public fatigue with Aboriginal rights issues and environmental restrictions on development contributed to a national political shift to the right and the election of conservative John Howard. In 1996, the newly installed Howard government reversed the original Hindmarsh ban, allowing South Australia to proceed with the bridge plan under the auspices of the Hindmarsh Island Bridge Bill of 1996. However, this did not end the controversy. The Ngarrindjeri challenged the 1996 bill in court and lost. 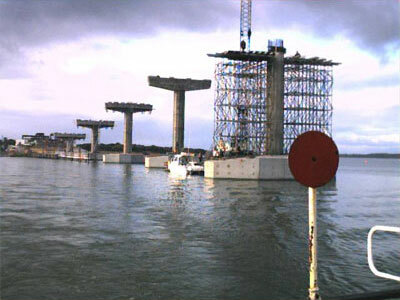 In 1999, the Government of South Australia contracted with the company Built Environs to build the 319-meter concrete Hindmarsh Island Bridge to carry motor vehicles across the river and to provide a structural span to support electronic and telecommunications transmission lines. The Chapmans then sued the Federal Government for $20 million in compensation. During that case, new evidence and testimony was presented, leading the Federal judge to determine that the Ngarrindjeri claims to a sacred site at the Hindmarsh bridge were not inauthentic. Stephen Kenny, the Ngarrindjeri lawyer in that case, asked for the bridge to be removed and an apology made to the Aboriginal people, for “they have been forever challenged on their beliefs, they have been called liars.” But, the bridge eventually opened to traffic in March 2001 and now carries approximately 2000 cars per day to and from the island. The credibility of a wide array of people, from the Aboriginal representatives to anthropologists, lawyers, politicians and environmentalist, had come into question over the issue of “secret women’s business.” Within the Ngarrindjeri community, divisions were even deeper, and many of the women still do not speak to one another. If one believes that education and positive public perception are critical steps to safeguard indigenous peoples’ sacred sites, the result of the Hindmarsh Island affair was the sacred sites protection suffered a setback. The public fervor has taken a long time to die down, but the controversy over the Hindmarsh Bridge has yet to completely disappear. Today, the Conservation Council of South Australia is still involved in litigation with the Chapmans, having charged them and their development company with destroying the Murray River estuary. Support the Conservation Council of South Australia in its continued efforts to protect Hindmarsh Island against further development. Bell, Diane. Ngarrindjeri Wurruwarrin: A World That Is, Was and Will Be. Spinifex Press, 1993. Borschmann, Gregg. “The Songlines Conversations: Diane Bell.” ABC Radio National, July 16, 2006. Broome, Richard. Aboriginal Australians: Black Responses to White Dominance, 1788-2001. Allen & Unwin, 2002. Brunton, Ron. “Unfinished Business.” Courier Mail, April 4, 1998. Gelder, Ken and Jane M. Jacobs. “Promiscuous Sacred Sites: Reflections on Secrecy and Scepticism in the Hindmarsh Island Affair.” Australian Humanities Review, June 1997. Kenny, Chris. “The Hindmarsh Island Debate: Reflecting on the Key Issues.” The Bennelong Society. Kumarangk Legal Defence Fund. The Kumarangk Legal Defence Fund. Nicholls, Christine. “Literacy and Gender.” Australia Public Intellectual Network. Simons, Margaret. “Hindmarsh: Where Lies The Truth?” The Age, May 9, 2003.